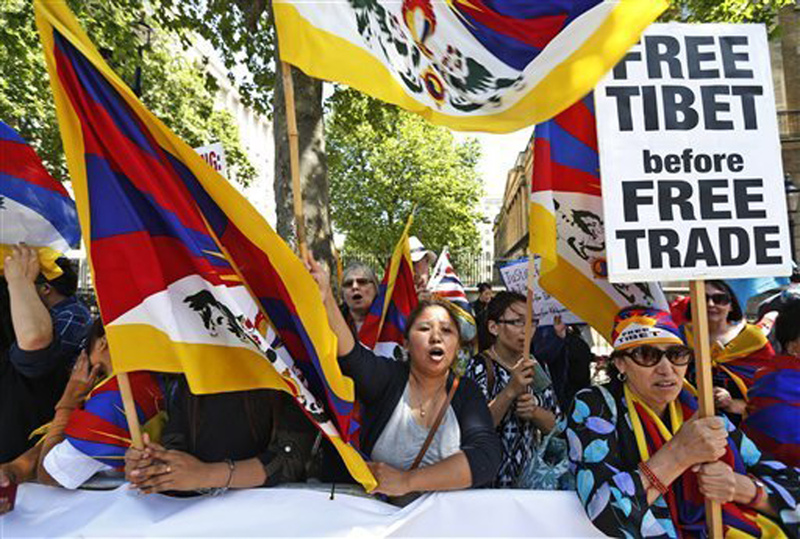 (TibetanReview.net, Jun19, 2014) –Chinese Premier Li Keqiang’s four-day visit to Britain, which focused mainly on signing trade deals worth some £14 billion, was marred by protests by Tibet supporters, Falun Gong followers and others. However, the Chinese embassy in London tried to drown-out their protests by conscripting hundreds of Chinese, mainly students, to welcome Mr Li with waving of the Chinese flag. The protest took place as Mr Li met with the British Premier Mr David Cameron on Jun 17 in 10 Downing Street. According to a news.sky.com report Jun 17, one young lady said the Chinese embassy organised the delivery of their water bottles and paid their band to turn up and drown-out everybody else. That was before she was silenced by an older gentleman. Among the groups protesting for Tibet were the Free Tibet campaign group and Students for a Free Tibet. Referring to the fact that Mr Li was received by the Queen at Windsor Castle, though he is not a head of state, Alistair Currie, media manager and spokesman for Free Tibet, has said, “Britain again has shown it’s willing to bend over backwards to appease the Chinese, so the symbolic importance of this act is very significant. It’s saying that China isn’t simply a trading partner, it’s something very special to us.” He has accused Britain of “effectively selling out Tibet” and being hypocritical because it recognised the right to self-determination in the Falkland Islands and Scotland, reported voiceofrussia.com Jun 17. It was earlier reported that Li had insisted on a meeting with the Queen, in violation of protocols, before confirming his trip. The meeting took place at the Queen’s Windor Castle on Jun 17. Padma Dolma of Students for a Free Tibet has said she successfully managed to block Mr Li’s convoy as it approached Westminster. “We had Tibetan flags and we were shouting the slogans ‘Free Tibet’ and ‘China out of Tibet’ repeatedly, and they could very clearly see us, which was great,” the news.sky.com report quoted her as saying. Britain’s acceding to Li’s wish for an audience with the Queen was seen justified by Mr Cameron. The dw.de Jun 17 cited him as saying the increasing dominance of China was “one of the defining events of our century,” and Britain was hoping to strengthen business and cultural ties with the emerging giant. Beijing had warned London ahead of Li’s visit not to lecture it on human rights if it wanted good economic ties.